Getting a child to brush their teeth can seem nearly impossible—let alone helping them enjoy their dental hygiene routine. Instead of just forcing your child to brush and floss, it may be time to take a different approach. Your children’s dentist in 97124 believes the more your child genuinely enjoys taking care of their smile, the more effective their brushing and flossing will be. Here are some helpful ways that can help change your child’s frown upside down when it comes to cleaning their precious mouths. Brushing and flossing alongside your son or daughter may change their perception about taking care of their teeth. As their leading role model, they look up to you—even when it comes to maintaining excellent dental health. If you’re taking care of your teeth properly in front of them, they’re more likely to copy you. You also have the opportunity to make sure they’re diligently brushing—meaning two minutes at a time including their tongue! If your child seems to be bored with their dental routine and would rather watch TV than take care of their smile, it may be time to add some spice to their hygiene routine. A wonderful way to combine their interests with their dental regimen is to buy them a new toothbrush. There are many toothbrushes that are kid-friendly by being decorated with their favorite cartoon characters. Just make sure that their new toothbrush is still soft-bristled! If you’re stretching still to gain your son or daughter’s interest, you may want to try switching out their toothpaste. 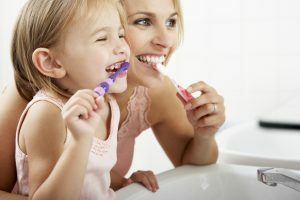 Although adults look forward to a fresh minty feeling after they finish brushing their teeth and gums, your child may not. Instead, they could be more intrigued from a cherry, watermelon, or strawberry flavored toothpaste infused with fluoride. It’s important that your child is brushing their teeth for the correct amount of time (2 minutes) to achieve and maintain optimal oral health. One way to help make their dental regimen fun is to play a song when they start brushing. They can wiggle around while brushing their teeth. This way, they will also associate the song ending with when it’s appropriate to stop brushing their teeth. They’re more likely to remove more dental bacteria if they brush for at least 2 minutes. Everyone likes being rewarded or recognized for the work they’ve completed. Positive reinforcement is a great learning tool for kids and will help instill good, consistent dental hygiene practices. Try creating a calendar with your child and place fun dental stickers or shiny gold stars every time they brush and floss their teeth. After so many weeks or a full month of great dental practices, reward them with something fun. You can get creative with this and develop a system that works best for you and your family. Contact the Dentists at Orenco for Kids! If you still need help getting your child to appreciate healthy teeth and enjoy their dental routine, feel free to contact your children’s dentist in Hillsboro. Sometimes, it can be helpful for someone other than the parent to explain the importance of maintaining a strong smile.